Posts tagged "DC Universe Online"
On Wednesday, the fourth DLC pack for DC Universe Online will hit the PlayStation Store. The DLC content is the first major update almost entirely focused on player versus player (PvP) combat. The Last Laugh will include hours of multiplayer gameplay in the Safe Houses and Headquarters, an all-new weapon, and new Light-Powered and Kryptonian Legends PvP characters. Sony Online Entertainment (SOE) has confirmed the date on which DC Universe Online becomes free-to-play, as originally announced last month. Originally pencilled in for this month, DC Universe Online will be switching to the free-to-play model as of November 1st. DC Universe Online will soon be free to download from the PlayStation Store, and free-to-play with no monthly fees required. So what’s the catch? There is none. The entire game will be open for you to play for free. DC Universe Online had added another free batch of new downloadable content that will introduce you to former Gotham City District Attorney-turned crime boss Harvey Dent (aka “Two-Face”) in the sinister new installment. Also included in this update is the final part to the Batcave raid where you level 30 players will be face-to-face with the caped crusader. It’s been two months since DC Universe Online was released in stores across Europe, but its only been available in stores. 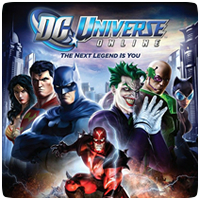 Sony has today announced that DC Universe Online is also coming to the EU PlayStation Store, as a digital download. The game will be available to download for €49.99/£39.99 with a 30 day subscription included at no extra cost. See the New York Comic Con trailer of DC Universe Online below. The new sizzler trailer has got it all: Heroes, Villains, Icons, Combat, the whole shebang. Although the game has been delayed to 2011, the developers are working hard to test and scale the servers and take feedback from the players so they can deliver a killer experience when the servers go live. Sony Online Entertainment revealed a new trailer for their upcoming PS3 MMO, DC Universe Online. The trailer (found below) reveals some of the over-the-top combat, as well as the powers and movement sets that players can choose from in making themselves the next great legend in the DC Universe – either as its savior or its destroyer. Remember the DC Universe Online teaser trailer we posted last week? You can now find the full trailer of the game below. The full trailer is a whopping 5 and a half minutes long, entitled “Who Do You Trust?”. In DC Universe Online, you’ll be able to team up with legendary DC heroes like Batman, Superman, and Green Lantern or pledge allegiance to the Joker, Lex Luthor, and other classic villains to determine the fate of the DC Universe.